This report analyses learning from around 450 grants, from three years of grant-making under the current strategy. A rich data source for grantees, funders and those active in the fields in which PHF operates, the report pulls together emerging challenges, trends and the outcomes being pursued in efforts to advance social justice. 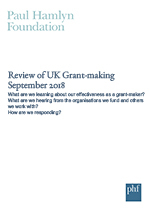 This work will inform our thinking about how best to support grantees to respond to the challenges they’ve identified as well as provide the support that is needed to foster innovative practice and grow impact.